At the G-8 Summit, he can help bear the brunt of climate damage caused by the developing world. But don't hold your breath. Bush at the 2008 G-8 Summit in Japan. President George W. Bush will have one last chance next week to alter his reputation as the leading villain in the global drama over climate change. Unfortunately, he’s likely to ride into the sunset as the proverbial outlaw in a black hat. 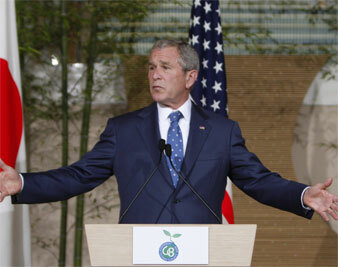 Throughout his time in office, Bush has stubbornly refused to comply with international agreements to curb carbon emissions. However, there has been some hope that at the upcoming Group of Eight (G8) rich country summit in Japan, the American renegade might at least commit to helping poor countries cope with the reality of climate change. This aid is desperately needed. Recent studies reveal that global warming is happening faster than scientists had originally predicted. And while the industrialized world, particularly the United States, has contributed disproportionately to global warming, it is the developing world that is bearing the brunt of the impacts. In Malawi, for example, hunger rates are rising among subsistence farmers as shifting weather patterns have delayed rains year after year, shortening the growing season by months. In Bangladesh, scientists predict that rising sea levels could force more than 20 million people to flee major cities, coastal planes and low-lying communities. The Bush Administration actually responded to the growing crisis earlier this year, by requesting $2 billion from Congress to help such countries avert climate catastrophe. However, members of Congress put this request on ice over concerns about the financing vehicle. Bush has insisted that the money go to the World Bank, despite serious criticism from developing-country governments and environmentalists. More than 130 developing countries have demanded that the administrator of all such funds be the United Nations, an institution they see as more democratic and accountable. By insisting on the World Bank (where the United States holds veto power over major decisions), the Bush Administration is driving a wedge between North and South, jeopardizing efforts to bring key developing-country carbon emitters, namely China and India, to the table for a global climate deal. Bush’s requested funds would go specifically to the World Bank’s Clean Technology Fund, which Brent Blackwelder, President of Friends of Earth-US, has jokingly dubbed the Slightly Less Dirty Technology Fund. The World Bank refuses to define what it means by “clean,” suggesting that it is likely to finance marginally more efficient coal-fired power plants rather than only genuinely clean wind and solar technologies. As things stand, Bush is likely to bring nothing but a rubber check to the G8 Summit. To avoid this embarrassment, the President should signal a willingness to work with Congress before the end of his term to ensure a generous donation to the existing UN facilities for assisting developing countries with their climate change challenges. Any funds for clean technology should be restricted to truly clean, transformational technologies, not “business as usual” fossil fuels. It may be too late for President Bush to go out in a blaze of glory on climate change. But at the very least, he should follow through on his commitment to help out those who’ve been on the barrel end of global warming. Millions of lives, not to mention the future of the planet, hang in the balance.